You could feel the mood change when she entered the lecture hall. Rudi Buys, her host and Dean of Humanities at the Cornerstone Institute, bowed and reverently welcomed her as “mama,” as among her country’s matriarchs. 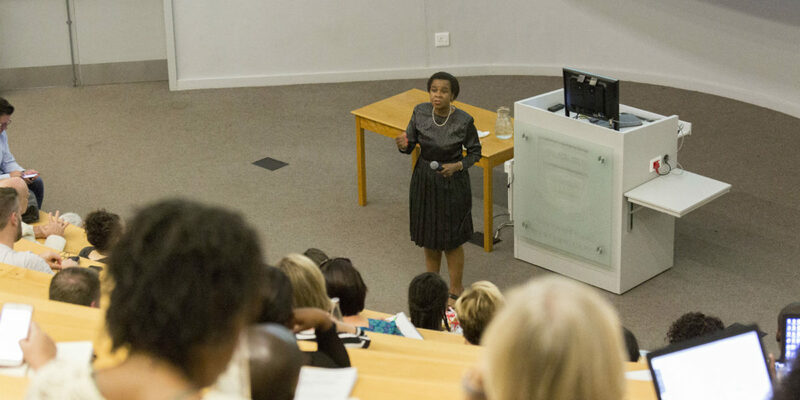 Dr. Mamphela Ramphele had arrived to speak before more than 60 students, faculty, administrators, and trustees representing TCS Education System and its affiliates on a recent study abroad trip to South Africa. A mother, doctor, scholar, and tireless champion for what ought to be in her nation’s political present and future, Ramphele is a living hero in the continuing saga of South Africa’s plight with pluralism and democracy. Her brush with history begins in the late 1960s when, as a medical student at Natal University, Ramphele met Steven Biko. Together they would help advance the Black Consciousness Movement (BCM), a cause that was as much about furthering the psychological liberation of their people as a political crusade. A perceived threat to its policies of apartheid, the government’s response was swift: Biko, whose voice was most associated with BCM, was banned. He lived his remaining days under constant surveillance and was forbidden to speak in public, publish, or even associate with more than one person at a time. Ramphele, now a physician, reunited with Biko in exile in King William’s Town in Cape Province. Here she founded Zanempilo, a community clinic that advanced BCM teachings, emphasizing self-help as a means to face the psychological toll of oppression. As word of her work spread, she too faced the ire of her government. Still in her twenties, Ramphele was banished to Lenyenye, a thousand miles from Biko and her beloved Zanempilo. It was here that Ramphele, pregnant with Biko’s child, learned of his death while in police custody. Sparks profiled Ramphele in his book The Mind of South Africa. Published in 1990, the same year as Mandela’s release, it remains an essential work on the rise of apartheid. Three years before, actress Josette Simon portrayed Ramphele in Cry Freedom, a prestige Hollywood treatment of Biko’s (Denzel Washington) friendship with reporter Donald Woods (Kevin Kline)—the film earned Washington an Academy Award nomination. Both works and others from that era depended on the heroism of figures like Biko and Ramphele to see audiences through the despair and injustice of apartheid. Listening to U2’s Rattle and Hum album, now 30 years old, is to hear lead singer Bono invoke the names of Mandela and Bishop Tutu in a plea for global awareness of the travesty of South Africa. To revisit these works today is to experience the novelty of a story in the darkest chapters of its second act, a positive ending far from assured. We know now what happened. We remember images of a newly freed Mandela, fists raised, marching with his wife Winnie through crowds of adoring fellow countrymen and women experiencing the exuberance of light finally rising through the darkness. We remember the movement of reconciliation and the delivery of democracy in 1994. Facing the horrors of the Soweto uprising in 1976, no storyteller would dream to envision a future where Mandela, then imprisoned on Robben Island, would eventually ascend to the presidency of South Africa. And yet it happened. But the story is far from over. As is the reality with all nations governed by their people, democracy is a process. After two terms, Mandela yielded his office to the will of the voters. Thabo Mbeki was his successor. He led for nine years until resigning from office in 2008—eight months before the end of his second term, essentially fired by the National Executive Committee of his party, the African National Congress (A.N.C.). A short tenure by Kgalema Motlanthe followed. Then came the ascent of Jacob Zuma whose fate is still being written. He resigned from the presidency last February and faces prosecution for alleged crimes of fraud and corruption against his nation. South Africa continues to reel in the aftermath of his reign—gross mismanagement of public funds, a greatly diminished reputation among the international business community, a public soured on political party corruption, and a high unemployment rate, just to name a few headwinds. “We get the leaders we deserve,” said Ramphele Speaking to our group. Her tone communicated frustration and disappointment, especially given all that she has witnessed over the last half-century. The exuberance of 1994, and its promise of a new beginning, today faces an uncertain future. Her remedy, if my interpretation is sound, is for good people with good intentions to rise, fill the void, and restore the promise of South Africa; likewise, a renewed commitment to civic education. I added my own commentary that politics itself is not inherently corrupt; it does, however, attract the easily corruptible. Ramphele seemingly affirmed my assertion. “Attitudes toward other creatures is conditioned by one’s level of security within the universe,” she once said. It’s always the second act of a story where conflict and uncertainty reach an apex. During South Africa’s darkest chapter, it was Mandela who helped move his country to a third act, where climax and resolution are at last realized. Today, we are in the second act of a new chapter of South African history. It will take a new leader to renew this cycle, the type that Ramphele longs for. At the end of her talk, a line formed, stretching to the back of the auditorium. It included people she never met wanting to meet her, embrace her, and have their photo taken with her to enshrine the memory of having shared space with her. Dr. Mamphela Ramphele took time for all of them. She didn’t leave until the final picture was taken. She was the last person out of the room, a fitting allegory for one who has witnessed so much and done so much to create a positive future for her country. She is the type of leader that South Africa deserves.